Intuit dominates small-business accounting with its Quickbooks software, but the company is also working on tools to help managers of small and medium-size businesses do more from smartphones and tablets when they are away from the office. The Quickbooks mobile app keeps business contacts separate from personal ones. During its Innovation Gallery Walk last week in Mountain View, California, Intuit showed off several new apps for small-business owners to manage their finances and get things done on the go. For many of the apps demonstrated, Intuit's focus was on creating a "mobile first" approach. Here’s a look at some of the highlights. The Quickbooks mobile app, available now as a free download, allows you to track estimates, invoices, sales, and receipts on a job site. Your Quickbooks data syncs from the desktop program, through the cloud, and down to the mobile app; the app works with either the desktop Quickbooks software or Quickbooks online. One of the most helpful features makes your Quickbooks contacts available directly, giving you the ability to start a call or send an email to someone on the contact list, and keeping your business contacts from getting mixed in with your personal phone contacts. 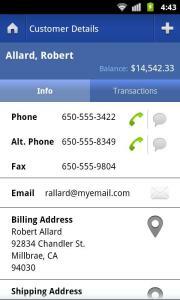 Intuit's mobile payroll app calculates payroll for hourly and salaried employees. Small-business owners who subscribe to Intuit's Online Payroll or Quickbooks Online Payroll services now have the option to take care of employee payroll from a mobile device. The app, available now for iOS and Android phones, can handle both hourly and salaried employees in three steps. After the app calculates all the tax withholdings and deductions, it can either set up the direct deposit for enrolled employees or tell you the amount to write on the check. Employee contact information is available directly from the app, too, so you can call a staffer to confirm that person's hours without having to look up the phone number elsewhere. The GoPayment service has been around since 2008; its smartphone credit-card reader became available in January 2010. Intuit's main goal with mobile payments is to make transactions as frictionless as possible. To that end, last week the company demonstrated a new debit card that you can pair with your GoPayment account. Funds you take in through GoPayment become available on the card, without going through a bank account. This arrangement simplifies the setup process and helps small businesses separate their business finances, as they use the debit card to make business purchases with funds directly coming from sales. GoPayment users will still have the option to transfer funds to a bank account. The debit card is "coming soon," but Intuit mentioned no specific time frame. Intuit is also working to improve the GoPayment system with cloud-based inventory, so that users can maintain inventory from a central point-of-sale system and push it out to floor salespeople or field workers using the GoPayment mobile app. One final improvement to the GoPayment service is the addition of near-field communication technology to send payment details between phones equipped with NFC chips. Both upgrades are coming "later," according to Intuit. Google Wallet's NFC system just went live earlier this month in the United States. At the event, Intuit detailed how security works with its GoPayment system, and why its list of supported devices is so much shorter than that of competitor Square (something I wondered about when I tested the two services). The GoPayment card scanner encrypts data before sending it through the audio jack to your smartphone or tablet, making it more difficult to ensure that each Android device is properly reading the protected data, but keeping security tight. 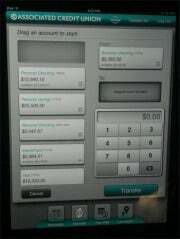 Intuit's mobile banking app, demonstrated on an iPad. One new mobile app, which launched in mid-September, serves as a companion for Intuit Financial Services banking websites. Intuit Financial Services provides websites and mobile sites for smaller banks and credit unions that either can’t develop their own or don’t want to do so. The Intuit-developed sites can help these banks remain competitive with larger institutions, which have more in-house development resources. The new mobile app comes with an improved check-deposit feature that allows you to deposit checks just by taking a picture of the front and back with your phone or tablet's built-in camera. For a small-business owner who takes in a lot of checks, this feature can save a lot of time, eliminating the need to make regular trips to the bank. The app is also one of the best-looking mobile banking tools I've seen, with an interface designed specifically for each platform. The tablet apps are especially well focused for making transfers and bill payments simple to track. Intuit’s demonstration of the app showed an easy-to-use interface for shuffling money and staying on top of overhead costs. Finally, Intuit is also looking to help small-business owners in India with Fasal. The service grew out of an effort to learn more about how small businesses operate in rural India, and turned into a project to help farmers there get the most cash for their crops. Most farmers sell to middlemen, not directly at the market. Fasal sends SMS messages to users twice daily with updates on the average sales price of crops, giving the farmers more information so that they can negotiate better prices for their own crops. It also sends them details about nearby markets to help them decide whether it's worth the trip to take their crops a few towns over.